Discussion in 'TalkCeltic Pub' started by Notorious, Dec 14, 2017. Discuss James McClean: in the TalkCeltic Pub area at TalkCeltic.net. James McClean has described a section of supporters “uneducated cavemen” after the Stoke City footballer suffered a torrent of abuse for refusing to wear a Remembrance Day poppy. Footage posted on social media showed Middlesbrough supporters in a corner of Stoke’s best365 Stadium hurl abuse at the Republic of Ireland international, who came on as a late substitute in the 0-0 draw between the two sides on Saturday afternoon. As McClean made his way to the players’ tunnel, Middlesbrough supporters booed the winger and unleashed a stream of invective, as stewards pushed a number of fans – all of them men – back from the perimeter fence. Late on Saturday night, McClean, who was also booed by some home fans, responded by quoting Bobby Sands, a member of the Provisional IRA who infamously died in 1981 on hunger strike while imprisoned in Northern Ireland. “They have nothing in their whole imperial arsenal that can break the spirit of one Irishman who doesn’t want to be broken,” McClean wrote, quoting Sands. He continued: “Your abuse, your throwing things, your booing, do your worst… to the home fans that are actually educated and support me, thank you. 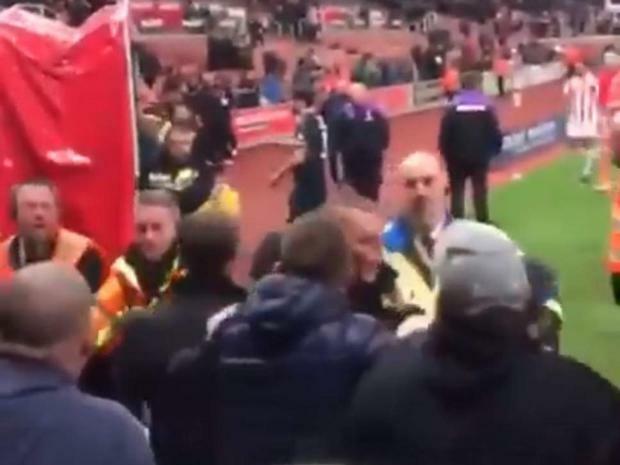 Gary Rowett, Stoke’s manager, defended his player and accused away fans of using it as an opportunity to “goad somebody”. "It's his belief and he's strong enough to come out and with his belief, whether you agree with it or not,” he told the Stoke Sentinel. McClean had confirmed earlier in the week he would not wear a poppy, a decision he has made every year - and been consistently abused for - since first moving to England to join Sunderland in 2011. "I know many people won't agree with my decision or even attempt to gain an understanding of why I don't wear a poppy,” he said on Tuesday. McClean was born and brought up in city of Derry, in Northern Ireland. He grew up on Creggan estate, where six of the people killed on * Sunday in 1972 came from. * Sunday was one of the most significant events of The Troubles conflict in the country, when British soldiers shot 28 unarmed civilians during a peaceful protest march. McClean objects to wearing the poppy because the symbol commemorates military personnel who have died in war – and not just soldiers who lost their lives in the First and Second World Wars. Johnny Dogs, BigWilly, Artorias and 8 others like this. Didn't see the game yesterday obviously but had a look on the Stoke forum this morning and again was pleasantly surprised by the way the majority on the forum seemed to engage in debate on this subject. From what I have seen ( fair enough just on the internet) Stoke City and their supporters have dealt with this far better then Wigan, Sunderland or West Brom ever did. James has singled out a specific section so there obviously are some dickheads at Stoke but the majority on their forum seemed to want to defend his rights and freedom of expression and condemned the abuse he got. ChrisMoh, Artorias, PARKHEAD67 and 3 others like this. Artorias, PARKHEAD67, bagforlife and 5 others like this. Johnny Dogs, Devlin, BigWilly and 3 others like this. There will always be some scumbags that sing and chant against him, a lot of people are sheep at football but when it's more organised groups of men going straight for him I would say it be a local Far-right group who come especially to give him abuse. NF and their modern equivalents like EDL are anti-Irish a big part of the far-right is still attacking Republicans it just does not get media attention. McClean is brave as they come so he won't be bullied by these racists. Devlin, PARKHEAD67, Gabriel and 1 other person like this. With this statement and Lennon a couple of days ago it will raise the question of anti Irish racism on the mainland as a whole. McClean has to answer the same question every year and face booing and abuse wherever he goes to do his job. Lennon is exactly the same and this will be played down in the weeks to follow. They have no shame in the fact for centuries the British have plundered, raped, murdered and stole homes and land from the naturalised citizen. Their governments have used their war machine through the years to bully and slaughter the defenceless. So to take enough, stand up, organise and retaliate is when you become a terrorist. A terrorist in your own country when you defend your family and home. But their biggest PR stunt was to strip us of our language and tried to eradicate our education and religion. They completely refuse to accept any wrongs or embarrassed enough to apologise to neighbours whom they look down on as second class citizens. The media as with Lennon have played a massive role in this with their silence or even criticism of both men. If this was orchestrated against a Muslim or Jewish player there would be great debate in the Commons and widespread criticism on TV and tabloids. The bigots can’t respect or accept the background of any individual that doesn’t conform or bow to their superior complex of their background. Zanderama, Devlin, BigWilly and 4 others like this. Aye and a lot of the * with Irish surnames. Oh the ignorant are mighty. PARKHEAD67, bagforlife and StPauli1916 like this. With regards to those cretins dishing it out i think it's pretty much a waste of oxygen......most of these clowns would struggle to spell the word debate never mind enter one!!! PARKHEAD67, bagforlife and packybhoy like this. ChrisMoh, packybhoy, Pablo87 and 5 others like this. Zanderama, Raoul Duke, Clint Eastwood and 1 other person like this. That's a *' joke, just proves it's only the Irish Catholics that get it tight.. Which is McClean's point. This is how the same newspaper covered his refusal to wear a poppy. Guy in the local post office has the poppy tins out but doesn’t wear one. Guy in the other week saying he should be as he is working for a part of the sovereign (post office) guy politely said look don’t wear it doesn’t mean anything to me. Old * has complained to Post Office about him not wearing one! Now am not clued up on all this pish but when did it become a legal requirement to wear one? GTF it’s choice and freedom is that not what the people who went to war (excluding NI) for??? Hypocrites every last * one if you ask me! McClean's outburst on Instagram came after he was verbally abused by some home supporters during the Championship clash with Middlesbrough last weekend over his refusal to wear a Remembrance Day poppy on his shirt. "But, when you understand the background to his beliefs and you see that his family have been sent death threats, his wife and kids have had abuse constantly and you see he's been sent things in the post, you can understand why he reacts; he's only human." bagforlife, StPauli1916 and Clint Eastwood like this. Deebo, celts67 and \o/ like this. A.M, Pearse67*, Johniebhoy. and 4 others like this.